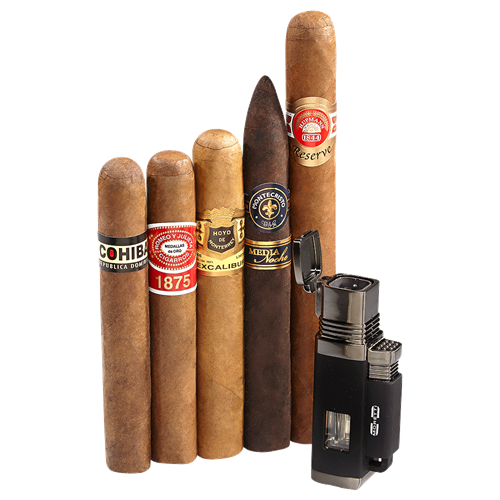 Save big on five top-rated Dominican premium cigars from the biggest names in the industry along with a Moretti Quad Torch lighter all for just $45.00! This epic cigar sampler features Cohiba Red Dot Robusto, Romeo y Julieta 1875 Bully, the ‘92’ rated Hoyo Excalibur Epicure, Montecristo Media Noche No. 2, and the ‘93’ rated H. Upman 1844 Reserve Churchill. Sealing the deal is the addition of a powerful four flame, refillable butane torch lighter featuring a rubberized grip and large fuel viewing window. A massive $100 value for just $45.00! !